This is the actual residential area consisted of being concentrated Korean traditional Hanok (a kind of houses) village, the only one in Seoul, is the residential area of high-ranking government officials and nobilities during the Joseon-dynasty (1392-1897) also. Bukchon village (literally meaning; north village) is located in between Gyeongbok palace(경복궁) and Changdeok palace(창덕궁), is uptown area from the Cheonggye stream and Jongno area. This is located so closely together also to Samcheonggil alley(삼청동길). It is dated back to Iron’s age (over 1500 years ago) to use Ondol and Daecheong systems which is featuring point of this house in Korea. In 1930s Hanyang (former name of Seoul) had gotten high population due to crowded people from the rural area and became highly concentration in many aspects. It had caused many social and economic problems, especially in their residential side. The demand meets the supply as it is. Company dealing with residence management bought large land in this area and built Hanok village which had been improved in the style of it as before. The size was smaller, glass door was installed at Daecheong, iron sheets was galvanized in its’ roof additionally to Cheoma (edge of Hanok’s curvy roofs), standardized wooden beam was used for its’ efficiency due to massive construction. New developed house of this style had been kept the characteristics of traditional house and been settled as a new type of urban house and showed luxurious decoration in particularly. It needs natural materials to build this house. Tiled roofs baked soil, pine trees for timber, stone-blocks construction for Ondol of the bottom in room, Hanji(Korean traditional paper used for windows and doors, beautiful and breathable), and patterned wall costs many expense. Ondol(온돌) is a kind of floor-rock-based heating system by principle of convection phenomenon during cold winters, Daecheong(대청) is a cool wooden-floor style hall on the front porch which keeps the house cool. Cheoma(처마) on the roof is to control the amount of sunlight that enters the house during hot summer. This is very expensive house to buy and to maintain. So ownership for this house means the symbol that owner is very rich and has the authority on many ways. It is very interesting that early 1900s some of the church of Anglicanism catholic was built in Hanok for naturalization of their religion, in Ganghwado, Jincheon and Cheongju which are still there. In 1970s, architect who learned modern architecture regarded Hanok as outdated and inefficient one. Besides, the propagation of complex type tenement housing and apartment caused the decreasing of the number of Hanok from 800,000 into 12000(today) in Korea so rapidly. 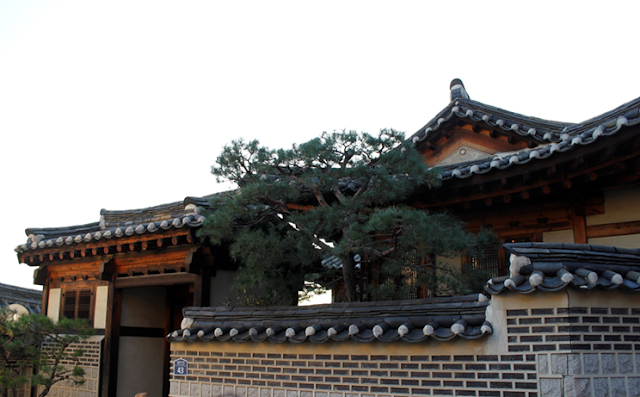 Now a days as by Hanok has decreased it means Giwa house (tiled roof) in the public senses with reduction of meaning. Fortunately, the value of this house is refocused with its functional efforts eco-friendly and therapy for atopy and asthma caused by environmental factors and unique beauty of this house itself. Reconstruction,gentrification, reservation efforts voluntarily is keep going on by area resident based on their opinions. Now it becomes to a street of traditional culture and art with unique styles mixing tradition and modernism, neighboring Insadong and Samcheongdong. Some difficulties are still left. It is inconvenience on the space of the functional connection by user’s circulation system. The wall is not thick enough and has some crack causing chill atmosphere. Wooden timber is very expensive still and it is difficult to find out the skillful builder. Despite of these reasons, new attempt to improve their house is trying continuously too also. This area is always crowded by Korean and foreigners. So you might be miss real worth and just end with only taking photos. And you might be in some fear to lose your way between in many alleys. Don’t be afraid. This is uptown, so can easily reach the lower road which is starting point. There are cultural center, guest houses, restaurant, and teahouse. Bukchon traditional culture center gives you an opportunity to experience, learn, and immerse in Korean traditional culture. Tip ; This is residential area. Houses are not allowed to get inside to the public. You can just see through by restaurant, tea house, craft houses only. I want to recommend to visit the Bukchon traditional culture center at first. Bukchon traditional culture center >>>click here ! !